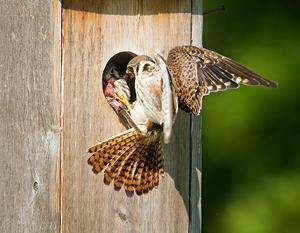 them, Cornell Lab of Ornithology has a great project called Nestwatch that can use your help. They have a list of birds which include Black-capped Chickadee, House Wren, House Finch, Carolina Chickadee, Mourning Dove and many others. Chances are at least one of these birds is nesting in your yard! If you are someone who regularly checks nestboxes, this might be the perfect project for you to take the info you discover about how many eggs, when they are laid, nest success, etc., and send it to Cornell. They use this information to get a better picture of the success and failure rates of nests and nesting habits of different species. Information like this is particularly important as birds are a barometer for what’s going on in our environment. So, check it out and see if you might become someone who helps backyard birds even more than you do by just sending in the information you already have. It’s a great project to do with kids as well, as they will have the chance to watch and record nesting from start to fledging. And who wouldn’t want to do that?